Halloween is the kick-off to the holiday season and what is not to love? Parties with costumes, candy and games – all things children and adults alike can appreciate. While trick-or-treating around the neighborhood is still popular, many parents prefer organizing an event at home. A children’s party is perfect to keep children safe and enjoy the festivities. Here are some quick tips for a killer Halloween party! Fall Festival? Fright Night? Pumpkin Picnic? 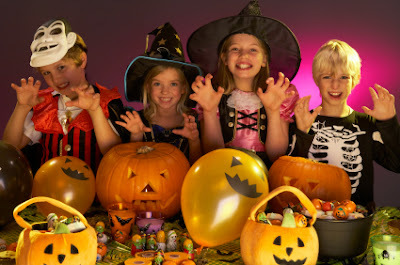 Like any other event, choosing a theme is the best way to get started with planning a successful Halloween party, that way everything is cohesive and you can plan around one idea. The choice of themes can depend on several factors such as the age of partygoers and available space. Pumpkin Decorating Content – Provide or ask guest to bring their favorite craft supplies such as paints, glitter, stickers, etc. An easy thing to provide is already cut-out paper lips, eyes, noses, then kids can glue them directly on their pumpkins. You can adapt to your chosen theme - “Scariest Pumpkin”, “Most festive” or “Best Scarecrow” to what fits best. Cookie Decorating – The same idea as decorating pumpkins can be applied to decorating cookies, “Best Monster” or “Funniest Pumpkin Face”. Bonus points because your attendants will get to eat their creations! No party is complete without snacks and treats. Keep in mind with little ghouls and goblins running around what will spill, stick, fall apart is usually not the best idea. Pre-filling food into smaller containers makes for easy distribution, such as a medical glove filled with wrapped candy or disposable cups that have veggie dip and carrots already filled. Don’t forget to include your beverages in on the fun! Fill ice cube trays with Halloween knick-knacks and freeze for a fun effect, each person will have a treat once it is melted. Let us know your favorite Halloween ideas and how you are celebrating this year in the comments below! About Tiny Keepsakes: Tiny Keepsakes proudly offers a wide selection of personalized keepsakes for your child. We specialize in kid’s step stools that feature chalkboards, wooden letters, puzzles and more! We offer distinctive gifts for every stage of your child’s life, as well as gifts for parents so that they can appreciate every memory of their precious little ones.